Dr. Md Rashedul Islam received his B.S. in Civil Engineering from the Bangladesh University of Engineering & Technology (Dhaka, Bangladesh) in June 2007, and his M.S. in Civil Engineering from Louisiana Tech University in March 2012. He then obtained his Ph.D. in Engineering with an emphasis in Civil and Construction Engineering from Louisiana Tech University (Ruston, LA) in 2015. He spent one year working full-time at a company in Ruston as a research engineer, where he worked on the mixed design of alternative cementitious material, design layout with AutoCAD, and material testing projects. Dr. Islam then worked as a teaching assistant at Louisiana Tech University and taught engineering graphics and physics courses. 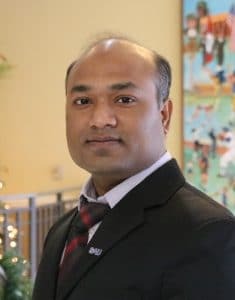 He worked as an adjunct faculty member for one year at Southern Arkansas University before joining the Engineering Program full time in August 2016. He has the experience of conducting advanced material research at the Oakridge National Laboratory (Oak Ridge, TN) and NASA Stennis Center (Hancock County, MS). Dr. Islam’s education and experience qualify him to teach a variety of courses in structural engineering, advanced manufacturing and other industrial technology, and engineering technology.